Deicide is one of the major Death Metal bands from the U.S.A. with Morbid Angel. Both bands were fast and brutal about 10 years ago and both are now slowing down a little. Ok live they still kill but since their last album Insineratehymn (not easy to write in one word: try it) they 're getting heavier and a little slower (for me at least). I'm sorry guys but when you know some bands from the beginning and you see them losing their velocity from their glorious years you ask yourself some questions. It is not that Deicide aren't brutal anymore, because the style is still there but the riffs aren't that crunchy and straight anymore as on the mighty Legion. Since the Insineratehymn the vocals and the guitars are sounding deeper and heavier. Some will like it, some will call it evolution but sorry guys it's not my cup of tea(side) anymore. 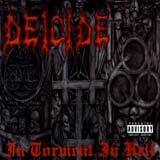 Except the tittle-track In Torment In Hell and Let It Be Done they are only mid-tempos on this CD.